steak teriyaki (and birthday wishes!) | Is there any wine left? Whit and I went home this past weekend to celebrate Jennifer and Mom’s birthdays. We had my mom’s side of the family over to celebrate – 12 adults, two children, and 7 dogs. We had one of our family favorites for dinner — steak teriyaki. Also known around these parts as steak-on-a-stick. I’ve lived in Texas and visited the Texas State Fair long enough to know that most things “on-a-stick” are downright delicious. This steak teriyaki is no exception. Anyway, the recipe is from my grandmother – my dad’s mom. She used to make it for my dad and his siblings each year on Halloween before they went trick-or-treating. Slice flank steak into strips, across the grain, about 1/4″ wide. Tip: stick the flank steak in the freezer for about 30 minuites before slicing. It will be firmer and easier to slice evenly. In a large bowl, combine the beef consomme or broth, red wine, soy sauce, lime juice, brown sugar, garlic, diced onions, and seasoned salt. 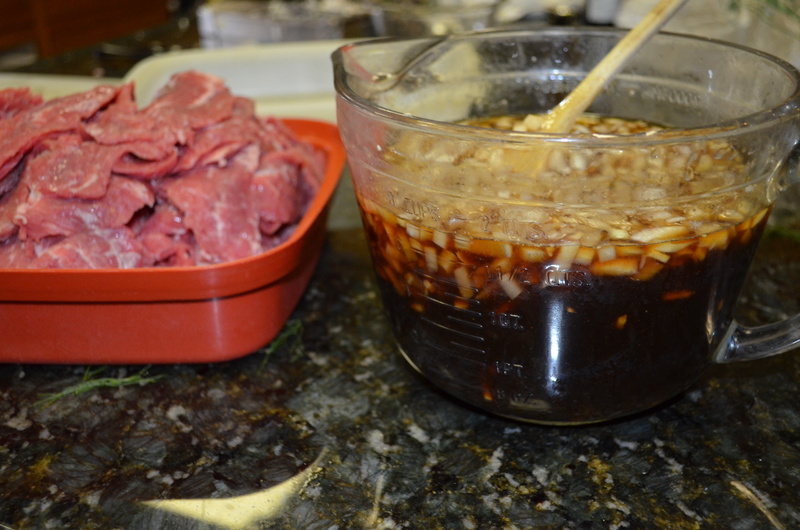 Pour the mixture over the sliced steak and let it marinade overnight in the refrigerator. When you are ready to cook the steak, drain and reserve the marinade. 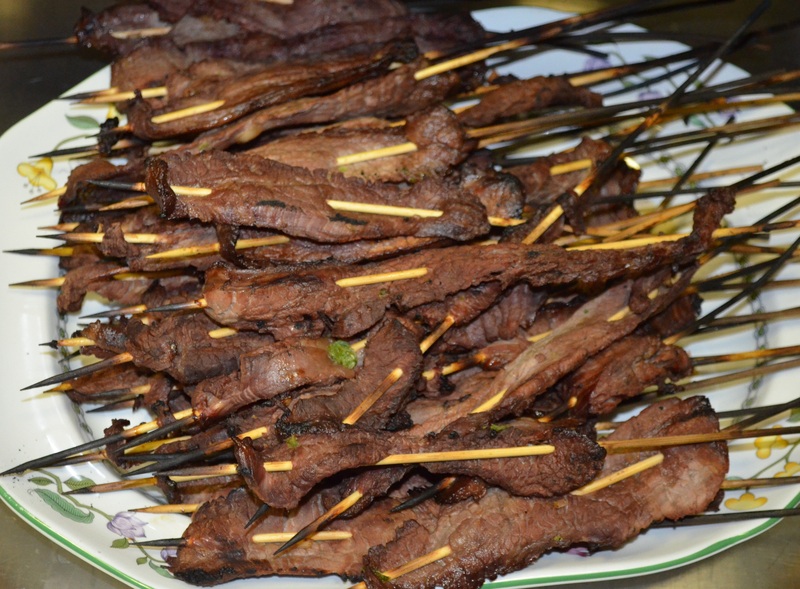 Thread the steak strips onto wooden bamboo skewers. Grill meat 2-3 minutes on each side, basting with reserved marinade while cooking. 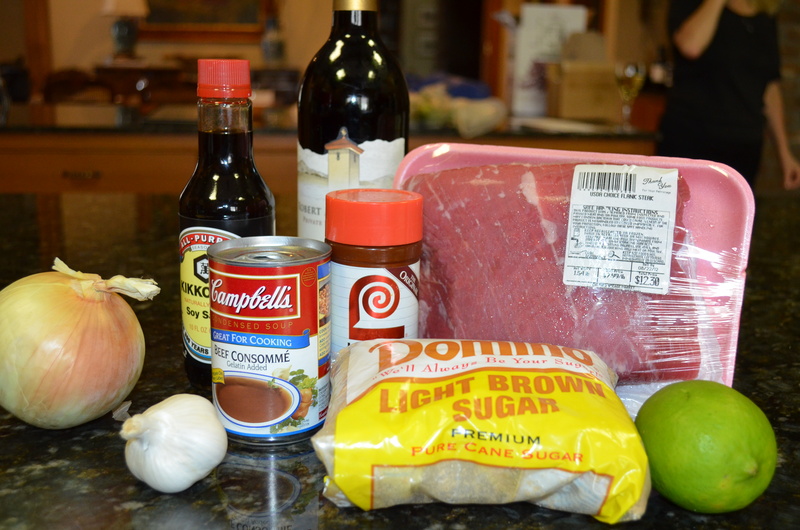 Combine all ingredients except flank steak and mix well. 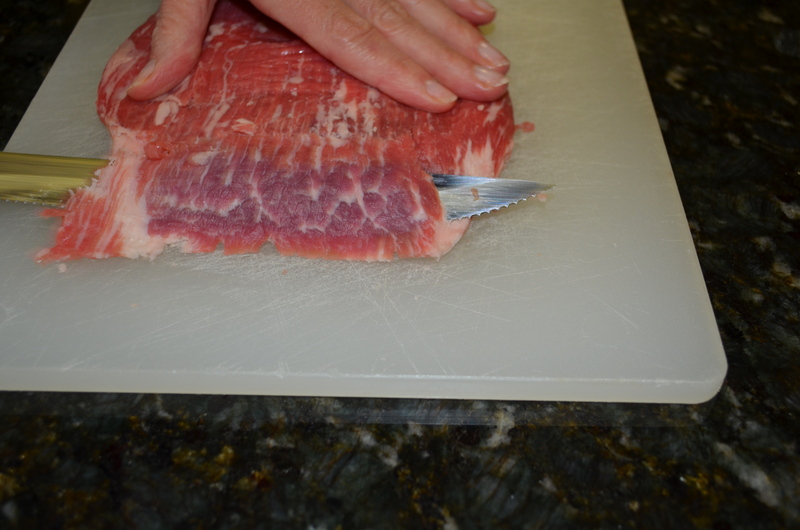 Slice flank steak into strips, across the grain, about 1/4″ wide. Marinate steak strips overnight in beef broth mixture. When you are ready to cook the steak, drain and reserve the marinade. 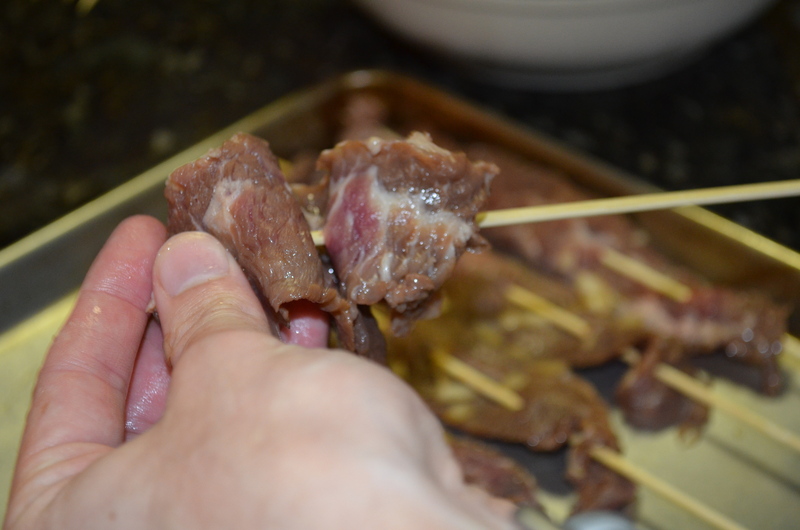 Thread the steak strips onto wooden bamboo skewers. Grill meat 2-3 minutes on each side, basting with reserved marinade. Note: you can double or triple the recipe easily for a crowd. My mom made these for us too. I loved hearing her talk about Granny making them on Halloween. Right after Colin and I moved to Cincinnati, I was craving something from home and we tried to make these on our little charcoal grill in the middle of an Ohio blizzard. It didn’t work out so well, but makes a fun memory.